Mitsuhiro Oikawa was officially announced as the Phantom Kamen Rider in this spring’s Superhero Taisen GP: Kamen Rider #3 at a cast announcement conference on January 27th. The Kamen Rider series first introduced Kamen Rider #1 and Kamen Rider #2, with V3 carrying the torch. However, half a year before Kamen Rider V3 aired, the 1972 issue of Bessetsu Tanoshii Youchien featured a story written by the original Kamen Rider author, Shotaro Ishinomori titled, Rider #3 VS Black Shogun. 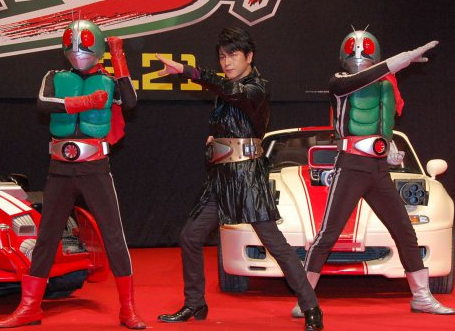 Like Riders 1 and 2, Kamen Rider #3 was modified by Shocker and his beloved car, the TriCyclone. After the defeat of Shocker in the final episode of the very first Kamen Rider series, a mysterious Rider makes himself known to Kamen Rider #1 and Kamen Rider #2. In the upcoming movie, Kamen Rider #3 will be portrayed as The Rider who should not have existed, who defeats Kamen Rider # 1 and Kamen Rider #2, then the reign of Shocker begins. The trailer highlighting Oikawa as Kamen Rider #3 can be found on the official Super Hero Taisen GP website.